🚨 Tonight at 6:30 p.m. ET/PT on "Axios on HBO": Bill Gates talks climate with Amy Harder and Ina Fried ... Alexi McCammond interviews Franklin Graham about Trump's bond with evangelical Christians ... and former White House official Cliff Sims shares never-before-told-on-camera tales of how Trump operates backstage. 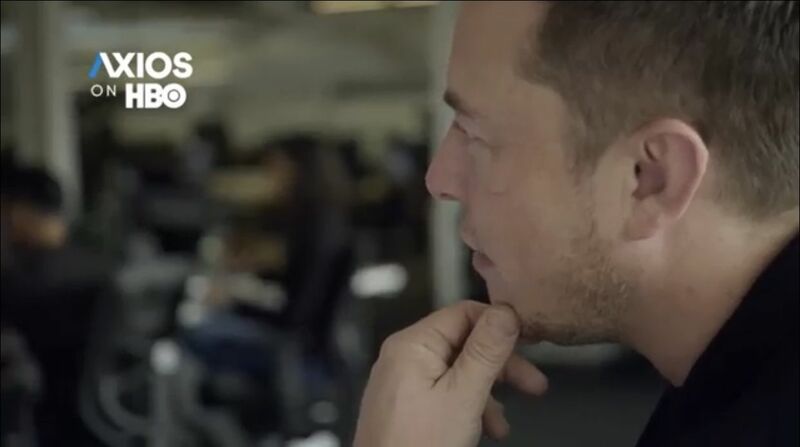 Elon Musk, age 46, told "Axios on HBO" that he sees a 70% chance that he'll live to ride one of his SpaceX rockets to Mars. "I know exactly what to do," he said. "I’m talking about moving there." That prediction is dismissed as fantasy by some experts. But Musk said he can envision a flight as soon as seven years from now, with a ticket price of "around a couple hundred thousand dollars." And even if you land successfully, Musk added, "you'll be working nonstop to build the base." "InSight should provide our best look yet at Mars' deep interior, using a mechanical mole to tunnel 16 feet ... deep to measure internal heat, and a seismometer to register quakes [and] meteorite strikes." "By studying the preserved heart of Mars, InSight can teach us how our solar system's rocky planets formed 4 1/2 billion years ago and why they turned out so different. "The cherry on top is that Mars may have once been flush with water and could have harbored life." "In two years, NASA will actually seek evidence of ancient microbial life on Mars — if, indeed, it's there. It would be past life: The "Martian surface is too cold and dry, with too much radiation bombardment, for life to currently exist." "Recorded observations of Mars — about double the size of Earth's moon — date back to ancient Egypt. But it wasn't until the 19th century that Mars mania truly set in." "Midwest farmers will be increasingly challenged by warmer, wetter and more humid conditions from climate change, which also will lead to greater incidence of crop disease and more pests and will diminish the quality of stored grain." Plumes of smoke rise near the Arc de Triomphe on the Champs-Élysées in Paris, decorated with the Christmas lights, during the second weekend of France-wide protests against a rise in the gas tax, and general discontent with fiscal burdens. 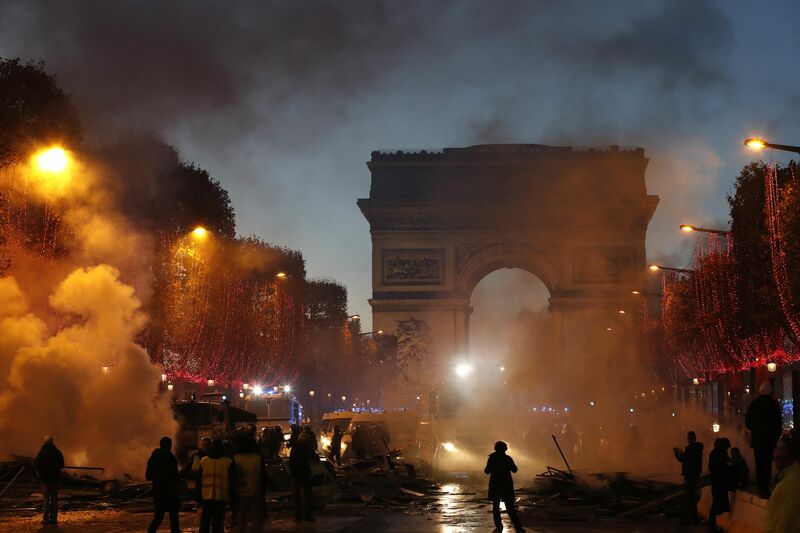 "Thousands of police were deployed nationwide to contain the eighth day of deadly demonstrations that started as protests against tax but morphed into a rebuke of President Emmanuel Macron and the perceived elitism of France's ruling class," AP reports. "Welling up rapidly from rural and forgotten France, this broad-based, citizen-driven movement is among the most serious challenges yet to President Emmanuel Macron’s pro-business government." ⚡ "BRUSSELS (Reuters) — European Union leaders formally agreed a Brexit deal [today] and urged Britons to back Prime Minister Theresa May’s package in the face of furious opposition in the British parliament." 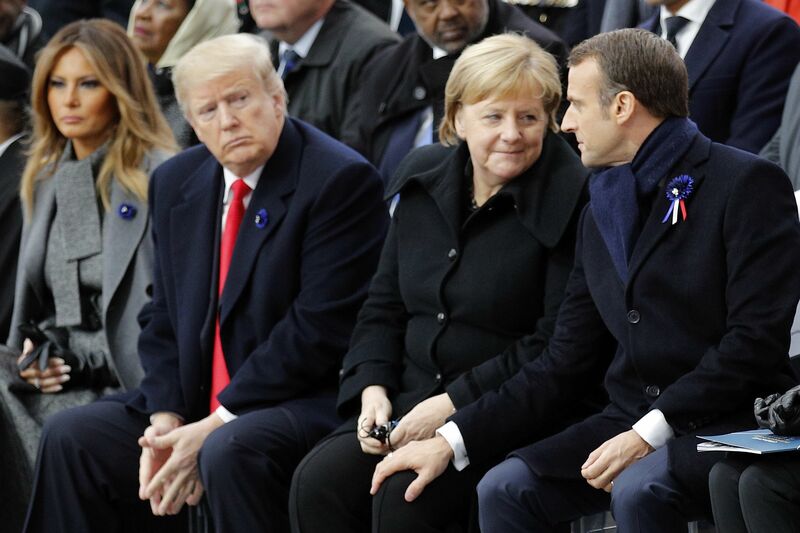 Trump tweets this morning: "The large and violent French protests don’t take into account how badly the United States has been treated on Trade by the European Union or on fair and reasonable payments for our GREAT military protection. Both of these topics must be remedied soon." 6. Formidable new barrier for migrants attempting to reach U.S. 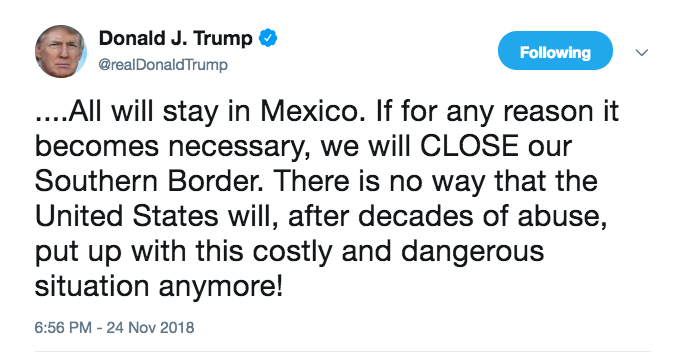 The Post's lead print story says he has a deal: "The Trump administration has won the support of Mexico’s incoming government for a plan to remake U.S. border policy by requiring asylum seekers to wait in Mexico while their claims move through U.S. courts, according to Mexican officials and senior members of President-elect Andrés Manuel López Obrador’s transition team." "Amazon expects — or plans to create — disruption." "Streaming could become the dominant media business in the next few years, which could mean that streaming companies become the leading sports broadcasters if they line up the right deals." "Amazon could aim to win exclusive rights for Monday and Sunday N.F.L. games when they come up for renewal around 2021." 🧠 Thought bubble from Axios' Sara Fischer: Amazon's strategy — including paying $50 million for exclusive digital rights to the NFL's "Thursday Night Football" — is notably different than its biggest streaming rival, Netflix, which has shied from investing in live sports rights. "[T]he evacuees’ arrival has worsened the state’s housing crisis and raised the possibility that they could be evicted from the region again, not by fire but by a scarcity of suitable dwellings." "Hotels and motels from Sacramento to Redding are full. The vacancy rate in the rental market, which hovered around 3% before the fire, has fallen to near zero." 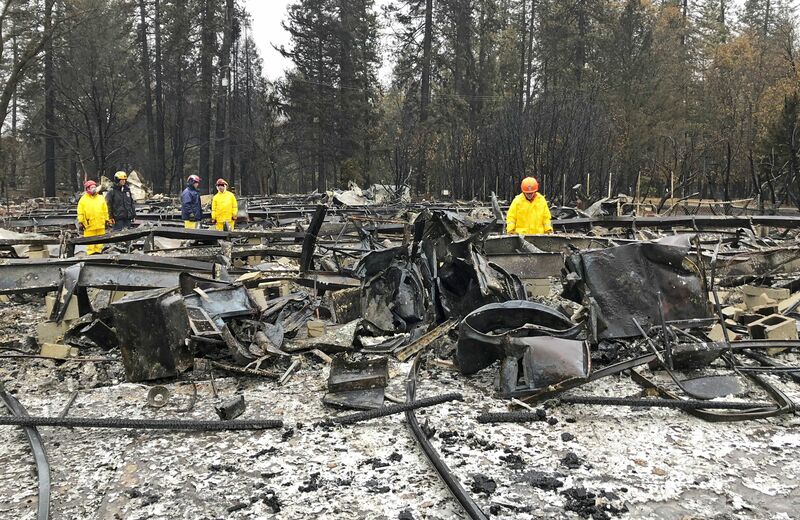 "Unable to find single-family homes in the area, evacuees have resorted to renting individual bedrooms, buying recreational vehicles and purchasing travel trailers." "Others are simply leaving California for other western states with a lower cost of living." "There’s a moment like this in every episode of How I Built This. 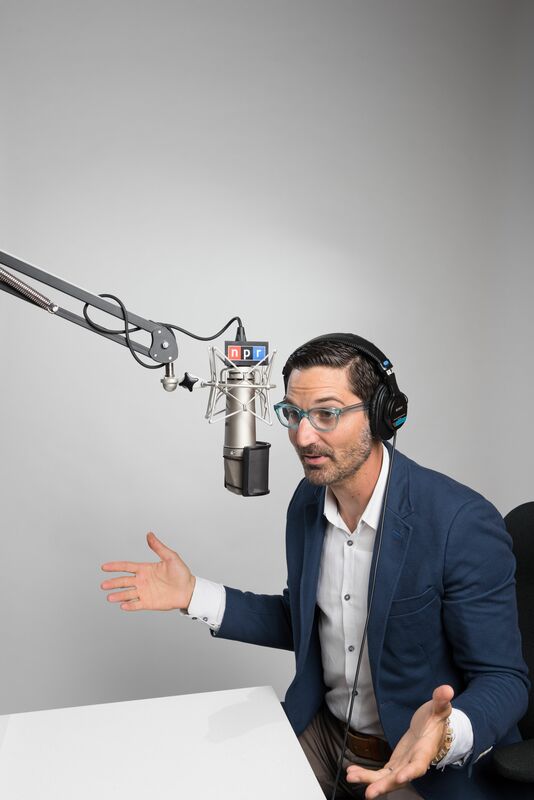 The guest has let his or her guard down and revealed something intimate, or financial, or financially intimate, and Mr. Raz keeps the disclosures rolling by reacting with total marvelment." A crazy night lasts until morning in College Station: Unranked Texas A&M beat No. 8 LSU, 74–72, in seven overtimes in the highest-scoring game in Football Championship Subdivision (college football's top level) history. "The previous record-holder for [FBS] scoring ... was a 2016 game in which Pitt beat Syracuse, 76-61.